While the smarter city conversation is traditionally led by local governments and large infrastructure companies, this year our UP Singapore initiative, in collaboration with Newton Circus and Gray Area Foundation for the Arts brings a complementary perspective to the conversation: ground-up urban innovation through open data, citizen engagement, and ‘urban prototyping’. Urban Prototyping is a new global movement where citizens contribute directly to improve city services by creating innovative web and mobile apps. From Kenya to Slovenia, from Port-au-Prince to Singapore, connected individuals are using new data and rapidly prototyping solutions to some of our most pressing urban problems. In this way, everyday citizens become true peers in the design and development of smart cities. 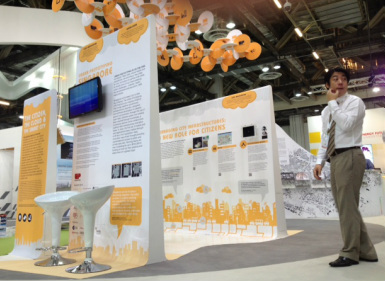 We are launching our exhibition - The Citizen, The Cloud & The Smart City: how open data, urban prototyping and empowered individuals are the secret to civic reinvention at the World Cities Summit. We will also be unveiling the first of our five-part printed series of the same name. Stay tuned for more details and video footage!